Stealing Trinity by Ward Larsen, a Mysterious Review. Review: Ward Larsen's second thriller, Stealing Trinity, wraps a fictional narrative around the unexpected Japanese attack on, and subsequent sinking of, the battle cruiser Indianapolis in the south Pacific just two weeks after the successful test of the atomic bomb in New Mexico in July, 1945. Just weeks before the April 1945 surrender of Germany during World War II, three high ranking German officers agree on a strategy to secure the future of the Reich by extracting a spy that was working on a secret project with the Americans in New Mexico code named Manhattan Project. They enlist the aid of a sniper, Alexander Braun, whose mission it is to take the spy and as much information as he can gather to a rendezvous point in South America. An aide to the officers who was ordered to destroy information related to the plan (but reads some of it before doing so) is later captured and interrogated by a British Intelligence officer Michael Thatcher. When Thatcher warns the FBI that a Nazi spy may be headed to the US, they not only officially deny the existence of a Manhattan Project but that with the surrender of Germany, a Nazi spy would have no motivation to continue any assignment he may have been working on. Thatcher is convinced there is more to the story and travels to the US where he learns that Braun attended Harvard University before the war and was romantically linked at the time to Lydia Cole, a Newport socialite. On a hunch, he travels to Newport and finds Braun a guest in the Cole residence. Braun escapes with Thatcher, and later Lydia, following him across country, determined to thwart whatever scheme Braun may be planning. Larsen strikes just the right balance in pacing Stealing Trinity, keeping the plot moving briskly forward but still providing time for readers to get to know the three primary characters yet not getting weighed down with potentially cumbersome historical minutiae. The plot is cleverly devised and provides a rational, even reasonable, explanation of why a Japanese submarine would be in a position to take down the Indianapolis. But the real reason Stealing Trinity succeeds is due to the exceptionally drawn characters of Braun, Thatcher, and Lydia. Braun's cunning and ruthlessness is depicted perfectly and his backstory (born in America to a father, a Nazi sympathizer, who forced him to leave college and serve Hitler, later returning to America, home as it were, albeit on a mission for Germany) adds color and depth. Thatcher, the reserved Englishman who lost a leg in the previous war but doesn't let a prosthetic slow him down, plays the cat to Braun's mouse. And Lydia, the pampered daughter of American aristocracy, shows spirited determination in chasing Braun, mostly for personal reasons, but also to demonstrate a new-found independence to her protective father. A solid supporting cast of characters are introduced as needed to move the plot forward, but they are clearly in the shadows of Braun, Thatcher, and Lydia. That in the final pages all three abruptly step out of character, one more than the others, is only ever so slightly disappointing. Stealing Trinity is an exceptional thriller that will captivate readers with its strong plot and even stronger characters. It is highly recommended. 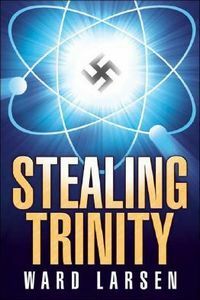 Acknowledgment: Maryglenn McCombs Book Publicity provided a copy of Stealing Trinity for this review. Location(s) referenced in Stealing Trinity: Berlin, Germany, London, England, Newport, Rhode Island, New Mexico, Guam.